Talk about an interesting color combo! 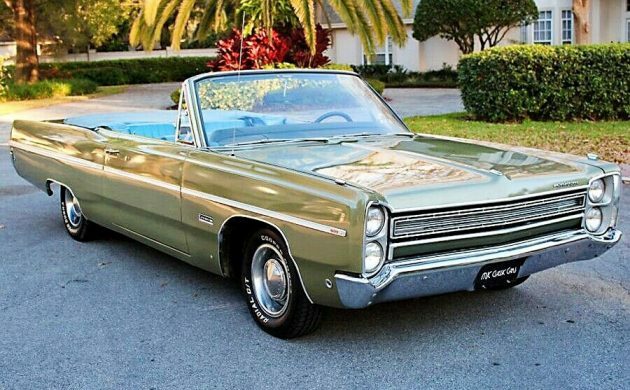 This 1968 Plymouth Sport Fury III Convertible is located in Lakeland, Florida and listed here on eBay and is believed to be a special order one of one car. At the time of writing bidding has reached an amount of $7,100, reserve not met and 6 days remaining in the auction. What makes this one of one is the odd color combination, green exterior with blue interior. 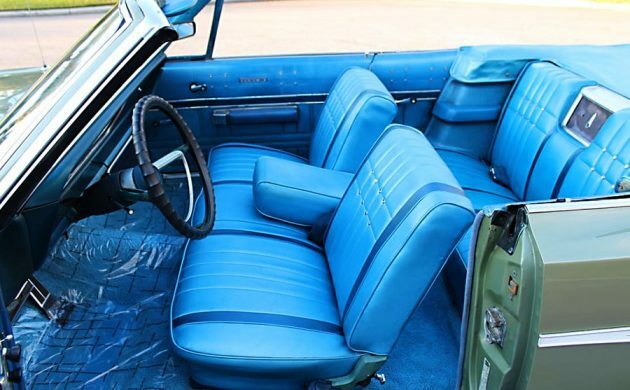 I can’t say I have ever seen a green car with a blue interior, but the seller seems confident it was ordered in this manner. They have provided many pictures and vehicle history traced to the original owner to document this fact. The VIN and vehicle data tag are provided for verification as well. The various online data tag decoders seem to support this unusual color combination. However, the same decoders also show it was originally ordered with a G code engine the 383 2 barrel, not the 383 high performance as indicated. 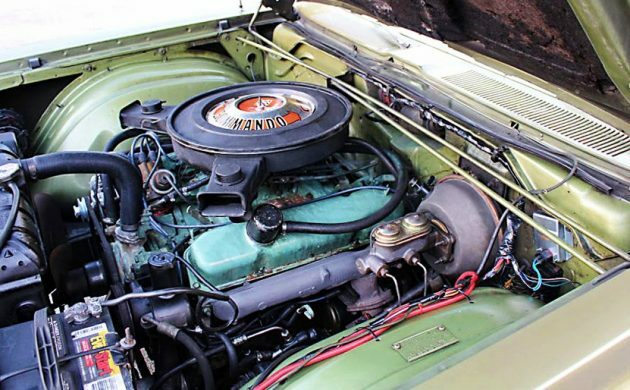 The engine bay could use some minor detailing and appears dressed up and imitating the high-performance version, with the duel inlet air cleaner. Regardless, the exterior of the car looks nice, having received fresh paint. Sometimes new paint can be a concern and may be hiding recent work or rust repair. It may be possible the car has had work on the lower rear quarters, the lines look a little different from left to right. However that may just be lighting or reflections but certainly warrants a visual inspection. The car looks good enough topside to be not overly concerned about the bottom and sub-frame rusting issues. The interior presents itself well in the pictures. Seats look to have been recovered with close to the original material. New carpet is available and has been used in this car. The sill plates are original but new reproductions are available on eBay. 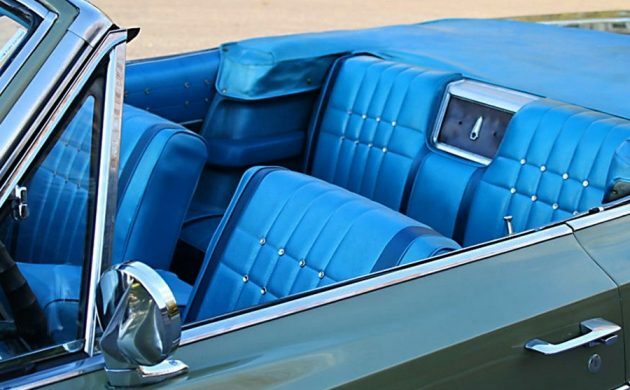 Door panels and Dash are original and with reproduction units not available, full interior restoration of full-size Chrysler products can prove to be difficult and expensive. The door panels looked to have been exposed to moisture. Also, the plating on the plastic trim looks to have peeling problems. As an interesting side-note, the same panel was used on same year Canadian Monaco 500. The FM converter seems out of place. Its dangling wire looks sloppy for the caliber of car. Overall the chrome and exterior trim are in very good shape. My preference for the tires would be a whitewall, perhaps 1” width, with factory wheel covers. The owner states the value of this car lies in its rarity. The contrast makes it rare, but I’m not sure about the value. Many potential owners would be turned off by the color mismatch. The car would make a great cruise night and car show driver, but would a future owner have the patience to constantly defend the unusual color combination? HA. The rarity of this car lies in its rarity, not so sure about value. Maybe the original owner was color-blind and this combo looked nice in greyscale. I have to say that the first (where I didn’t notice the interior color) had my pulse climbing. I just can’t reconcile that interior color with the exterior color. By themselves I LOVE the car. But I’d be looking to paint it white and that would probably be a shame. Most likely an end of model year order by a zone rep. They were notorious for specifying cars that emptied the parts bins. The last oddball I remember getting for stock was an ’81 Plymouth Reliant 4 door. It was midnight blue with a red interior. We sold it to a woman from England who just loved the combo. We decided to take the car as the other equipment was right and we needed the inventory for summer sales. Being a small dealership meant we had a small allocation and took advantage of the sales banks. I would paint it a blue and replace the top because it is cut or torn. The colour combination wouldn’t concern me as I can only see either the inside or the outside at any one time. Both colours are lovely. Sitting in the drivers seat looking behind the blue dash and steering wheel then over the long green hood wouldn’t bother you? Maybe that’s why there is a black steering wheel cover on it, or maybe the steering wheel is cracked. Hi Poncho. I don’t think I would be able to see the hood while driving, but even if I could it wouldn’t worry me as I would be so happy to be just driving the car. Ken, As a previous owner of many of these, I guarantee that the hood is plainly visible while driving it. I threw up as soon as the pics loaded!! Lol Former stevie wonder what happened special! I think someone got fired over this one ! This is a Fury III, nothing to do with a Sport Fury! Sport Fury was the top of the line with bucket seats and no side trim. My mother bought a year old one. It was a great car!! As far as the color on this one, I’d have to repaint it. As I recall, about that time our dealership received a green Ram with blue interior. As was stated above, it was a problem which came from a “let’s clean out the parts bin” approach at the factory. 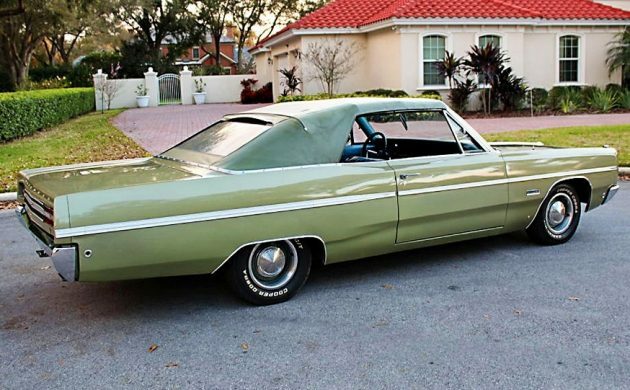 In the late 60’s we bought a stick-shift Chrysler 4-dr from our district rep because it had a fur coat in the trunk. Standardization has ruined the marketing craziness and I miss it. Don’t trust anything out of Lakeland, FL. Dang, this is a beauty. I’d proudly drive this baby everyday. Not very well presented. The author is correct, wrong carb and air cleaner. No vacuum connections for the cold air duct valves on the air cleaner, wrong alternator installed, upper radiator hose swelling, a $2 patch battery terminal, master looks damp at the booster. What else was cobbled together on this car to get it to run? The car also appears to be sitting lower than normal. I’d definitely check the oil and trans fluid colors/condition and get it up on a rack. This car, aside from the very odd color combo, needs a professional going over before a bid is placed otherwise, buyer beware. I don’t believe that air cleaner was available in ’68. Also, 440s were Super Commando. Seller is an established flipper, they do what they have to do to make sure the cars run, then shine ‘em up and put them on the market. They know little to nothing about a car’s background nor do they care. Caveat emptor, indeed. This is not a Sport Fury, it’s a Fury III. Nice car, I’d have either color just NOT ON THE SAME CAR . None the less, I’d love to own it. Hideous color combination. The interior should be black, white, or green. But in all fairness, I went to school with a guy who had a blue eye, a green eye, and red hair. He was quite popular ! 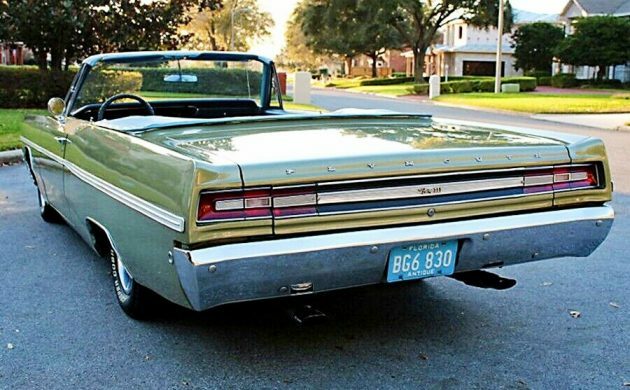 My father was a Dodge, Chrysler, and Plymouth dealer in a rural area during the sixties and seventies. Back then he said being a smaller dealer in a rural area he sold about twice as many trucks as cars so they ordered a lot of trucks. The factory therefore told them for every two trucks they were delivered they had to take one car too. They would order what sold as far as cars went but occasionally the factory would send them some of the ugliest cars he said he had ever seen and some real oddities too. He remembers a truck they got in one time that he said was a leftover at the shipping yard and since they sold so many trucks he never turned down a truck. I was a 3/4 ton lime green with orange interior. he said he was sure they would never sell it but as chance would have it an old farmer came in and needed a truck and he just happened to want a 3/4 ton truck. he locked onto that truck right away and bought it. In doing the paperwork the salesman found out the man was completely colorblind. Lucky huh? He also had a 1971 Chrysler New Yorker come in once that was a (believe it or not) six cylinder. He said it was slow to take off and had very little power. Luckily he sold it to a retired pastor and his wife who said they wanted a “nice car without a lot of power.” He had a Superbee come in once that was blue with an orange colored interior and the scoops on the hood were painted the same color of orange. Dealer rep was at a loss for words with that one but he said it sold fairly quickly anyway. The guy that bought was actually an alumni-st at a local college with the same colors for their teams. There are some oddities out there but they are mostly factory mistakes or like you said, “empty the parts bin builds”.